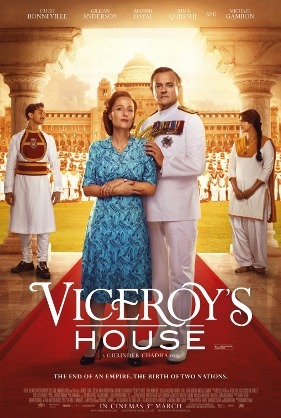 IFC Films releases Viceroy's House on September 1st, 2017 at IFC Center and Lincoln Plaza Cinemas. NYC MOVIE GURU: When it comes to entertaining the audience while provoking the audience emotionally and intellectually, which of those elements was most challenging to tweak in the editing room? Gurinder Chadha: It's a combination of all of that. The challenge was to tell quite a complicated political story in simple terms so that audiences wouldn't be lost in what's going on. I think that by personifying a lot of it through the characters and their emotional journeys, that's how we thought was the best way to tell a complicated period in history to people who might not know anything about it. NYC MOVIE GURU: How did you decide what to omit from history to condense the film so that it wouldn't be 8 hour long? GC: If I wanted it to be 8 hours, I would've made a documentary---which I did. I made a separate documentary for the BBC that recenly got aired. I think that Viceroy's House is the kind of film that had to be entertaining as well as informative while also shine a light on the events of 1947 that very few people in the world know about. A lot of what's going on in that region today has roots in the events of 70 years ago. So, for me that was the challenge. What we omitted was some of the details that Indians and Indian historians already knew. I always had to be clear that I'm making this film as a British Indian woman, and it's from that perspective that I was telling history. People like me don't often get to tell history the way that we see it. Once I was clear that that was what I was doing, then I made my choices accordingly. NYC MOVIE GURU: Why do you always include love stories in your films? Do you think love always trumps hate? GC: Totally, it does. It's true. When someone's on their dying bed, what someone wants is love around them. They don't want to be surrounded by hate. It's a universal emotion that we can all relate to. When you want to tell a story about people from different sides of the tracks, then obviously a love story is the way to do that. So, we have a love story in Viceroy's House, but it wasn't a traditional kind of love story; it's about 2 people who had been in love and decided to finish it, but they can't quite let go. The political situation makes their love story more urgent. NYC MOVIE GURU: How challenging is it to find a way hook the audience within first few scens? GC: If you haven't got your audience within the first 10 minutes, then you've lost them, really. As filmmakers, we all have to work hard on those opening minutes. We have to set up the world and the expectation of where your story is going. I wanted the audience to feel that they were going to sit back, relax and enjoy a very sumptuous British costume drama---something they're familiar with like a Merchant-Ivory or David Lean film. As we start unpicking the story, suddenly the stories about the servants and cooks and everyone else in the underbelly begin the form, and you feel more emotional about the downstairs people. So, it's quite an art, I guess, but that's what I do as a filmmaker. I take people who you think you would never have anything in common with and then make you realize how you have many things in common with them. NYC MOVIE GURU: How did you find the right balance between light and dark elements? GC: As a director, that comes from me. Some directors like to live in dark and make dark stories that appeal to them, and that's how they see the world and humanity. Some see it through comedy. Personal films are really an extention of your personality. Viceroy's House really represents different sides of me. I can be quite frivolous when I want to be and certainly emotional when I want to be. I always aim to make the audience go through a gambit of emotions when they're watching my films. For me, that's what I rate as a great movie: when it's really touched me and pulled out all of these emotions from me. NYC MOVIE GURU: Do you see yourself as a humanist filmmaker? I certainly do. GC: I think you're right. Part of that comes from the fact that I'm from so many different cultural backgrounds. I'm Indian, but I was born in Kenya. I grew up in London, my husband is from America, and his father is Japanese. So, those of us we come from diasporic multi-cultural communities, we see the world in a different ways than those who are mono-cultural. Our is a world where we are inclusive. We don't create barriers between people; we make connections. For us, the world is about how we're all connected, not how we're all divided. That's my goal as a filmmaker. NYC MOVIE GURU: I believe that humanism is a truly special effect while CGI is merely a standard effect. Do you agree? NYC MOVIE GURU: What would make for a great double feature with Viceroy's House?